The NTSB cited an operational error by a tower air traffic controller as the probable cause of a near mid-air collision involving a commercial jetliner and a small private plane over the Gulfport-Biloxi Airport. On Sunday, June 19, 2011, at 12:35 p.m. CDT at Gulfport-Biloxi International Airport, a Cessna 172 was cleared for takeoff on runway 18 by the tower air traffic controller. Sixteen seconds later, the same air traffic controller cleared an Embraer 145, a commercial passenger flight, for takeoff on runway 14, the flight path of which intersects the flight path of runway 18. While both airplanes were about 300 feet above the airfield, the Embraer passed in front of the Cessna. The closest proximity between the two planes was estimated to be 0 feet vertically and 300 feet laterally. The Embraer 145, N13929, operated as ExpressJet flight 2555 (dba Continental/United Express) was carrying 50 passengers and 3 crewmembers, and was bound for Houston Bush Intercontinental Airport (IAH) where it landed uneventfully. The Cessna 172P Skyhawk, N54120, operated on a local instructional flight carrying an instructor and a student. No one in either airplane was injured in the incident. The number of airprox incidents in the United Kingdom involving commercial passenger aircraft remained static in 2010, according to a report by the UK Airprox Board (UKAB). There were 35 incidents involving passenger aircraft in 2010, the same number as 2009. The majority of these incidents involved the airliner conflicting with a military or general aviation light aircraft. However, for the first time in over 10 years none of these incidents were regarded as ‘risk-bearing’. As it published its 2010 data analysis, the UK Airprox Board (UKAB) said that year-on-year airspace conflicts involving two commercial aircraft had halved, with only 5 incidents in 2010 compared to 11 in 2009. The steady decline in these types of incidents from the early 2000s (in 2002 there were 39 such incidents) is due a combination of factors including the airline industry’s adoption of sophisticated collision avoidance systems and the combined efforts of operators and air traffic controllers tackling the issue. Overall, however, the total numbers of incidents increased on 2009, with 167 incidents in 2010, compared to 147 the previous year, largely as a result of an upturn in conflicts involving military and general aviation aircraft. UKAB reports, produced jointly for the Chairman of the Civil Aviation Authority and the Chief of the Air Staff, Royal Air Force, are principally aimed at UK pilots and air traffic controllers, both civil and military. Their purpose is to promote air safety awareness and understanding by identifying and sharing the lessons arising from UK Airprox incidents. The latest report from the UK Airprox Board (UKAB) shows an improvement during the first six months of 2010 in the most serious airprox incidents involving commercial air transport aircraft, with no reported events at all concerning passenger airlines in the highest risk categories. There had been one category B incident during the first six months of 2009. There was, however, a small overall increase in reported airprox incidents between January-June 2010 compared to the same period the year before. There were a total of 79 incidents in the first half of 2010 involving commercial, military and general aviation aircraft, in contrast to 60 during January to June 2009. General aviation aircraft were involved in ten more incidents than in the same period the year before – 44 compared to 34. These included two category A incidents, an increase on the single category A incident during the same period in 2009. Today’s report shows that the causes of airprox incidents remain predominantly late sightings and non-sightings of aircraft by pilots. The majority of these occur in Class G (uncontrolled) airspace where pilots have the responsibility to see and avoid other aircraft. The U.S. National Transportation Safety Board has been investigating an operational error that occurred near New York City on January 20, 2011. The Safety Board was notified of a Traffic Collision and Alerting System (TCAS) resolution advisory that occurred due to a near midair collision involving American Airlines flight 951 on January 20, 2011, at about 22:30 The American Airlines aircraft, a Boeing 777-200 (N766AN), had taken off from John F. Kennedy International Airport en route to Sao Paulo, Brazil and was flying southeast. A flight of two U.S. Air Force McDonnell Douglas C-17 transport planes was heading northwest toward McGuire Air Force Base, New Jersey. There were no injuries in the incident. The NTSB has interviewed air traffic controllers on duty at the time of the incident, and is gathering information from American Airlines and the Air Force. The air traffic controllers talking to each of the aircraft received conflict alerts, and immediately provided traffic advisories and turned their aircraft to resolve the conflict. In addition, the American Airlines crew responded to directions provided by TCAS. Radar data indicate that the aircraft came within a mile of each other at their closest point. The incident occurred about 80 miles southeast of New York City. The National Transportation Safety Board is investigating a near midair collision between a commercial jetliner and a small cargo aircraft that came within an estimated 50 to 100 feet of colliding near the Minneapolis-St. Paul Airport (MSP). On September 16, 2010, about 06:49 a.m. CDT, US Airways flight AWE 1848, an Airbus A320, was cleared for takeoff on runway 30R en route to Philadelphia, Pennsylvania, carrying five crewmembers and 90 passengers. At the same time, Bemidji Aviation Services flight BMJ46, a Beech 99 cargo flight with only the pilot aboard, was cleared for takeoff on runway 30L en route to La Crosse, Wisconsin. Weather conditions at the time were reported as a 900-foot ceiling and 10 miles visibility below the clouds. Immediately after departure, the tower instructed the US Airways crew to turn left and head west, causing the flight to cross paths with the cargo aircraft approximately one-half mile past the end of runway 30L. Neither pilot saw the other aircraft because they were in the clouds, although the captain of the US Airways flight reported hearing the Beech 99 pass nearby. Estimates based on recorded radar data indicate that the two aircraft had 50 to 100 feet of vertical separation as they passed each other approximately 1500 feet above the ground. The US Airways aircraft was equipped with a Traffic Alert and Collision Avoidance System (TCAS) that issued climb instructions to the crew to avert collision. The Beech 99 was not equipped with TCAS and the pilot was unaware of the proximity of the Airbus. There were no reports of damage or injuries as a result of the incident. NTSB and FAA investigators conducted a preliminary investigation at the Minneapolis airport traffic control tower on September 18th and 19th and are continuing to review the circumstances of this incident. According to ACARS data, Flight AWE1848 was carried out by A320 N122US. The Dutch Safety Board published the investigation report into a serious airprox event in November 2006. A Cessna Citation departing from Rotterdam Airport (EHRD) and an approaching Boeing 737 had a traffic conflict due to the misconception of ATC that the Cessna Citation followed a different standard instrument departure procedure than it had actually been cleared for. N666MX, a Cessna 560XL Citation Excel, executed a charter flight from Rotterdam Airport to Cannes Mandelieu (LFMD). The aircraft was cleared by the tower controller for a “Woody1B” departure after take-off from runway 24. When N666MX was handed over to Rotterdam Approach, the approach controller assumed that the aircraft was cleared for a “Refso1B” departure and would fly in westerly direction. Approach instructed N666MX to climb to FL50 to pass overhead the inbound PH-XRV. fly to beacon RTM. When the aircraft was handed over to Approach, it was cleared to descend further to 3000 feet for a radar vectors approach to runway 24 of EHRD. Because N666MX turned left to follow the “Woody 1B” departure and PH-XRV levelled off at about 5100 feet instead of 3000 feet, the separation between both aircraft diminished. Although several clues were available, the approach controller did not notice the impending traffic conflict. When N666MX turned to the left to follow the “Woody1B” departure, the airplane would cross the intended flight path of PH-XRV. Both aircraft received a TCAS2 resolution advisory (TCAS RA); PH-XRV was instructed to climb and N666MX was instructed to descend by TCAS. Almost at the same time the conflict was noticed by the approach controller who instructed N666MX to turn right to heading 330. As a result of all instructions, (TCAS RA and the instructions of the approach controller) the conflict was solved and both aircraft continued the flight without problems. The closest distance between both aircraft was 0.4 nm horizontally and 900 feet vertically. The crew of both aircraft had visual contact with the other aircraft during the conflict. The most probable cause of this serious incident was the misconception of approach control about the standard instrument departure flown by N666MX. 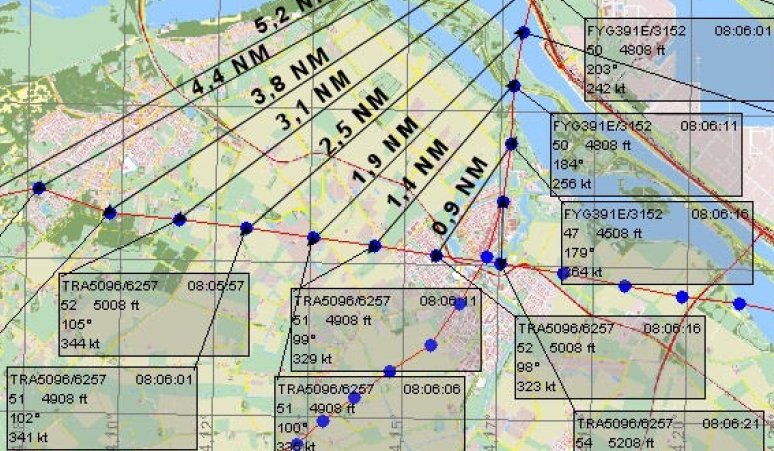 A possible mid air collision was prevented by TCAS and the instructions of approach control. The non optimal physical and mental condition of the controller possibly caused by fatigue. The suboptimal conditions for controllers from Rotterdam Airport to perform approach control duties in the common IFR room at Schiphol Oost. Not reacting of the ATC instruction to descend to 3000 feet by the crew of PH-XRV. The NTSB has launched an investigation to determine why a commercial jetliner and a small light airplane came within an estimated 300 feet of colliding over San Francisco on Saturday March 27, 2010. The pilots saw a light high wing airplane, an Aeronca 11AC (N9270E), in a hard left turn traveling from their 1 o’clock to 3 o’clock position. The first officer pushed the control column forward to level the airplane. Both crew members reported seeing only the underside of the Aeronca as it passed to within an estimated 200-300 feet of the 777. TCAS then issued an “ADJUST VERTICAL SPEED” alert, followed by a “DESCEND, DESCEND” alert. The first officer complied and the flight continued to Beijing without further incident.